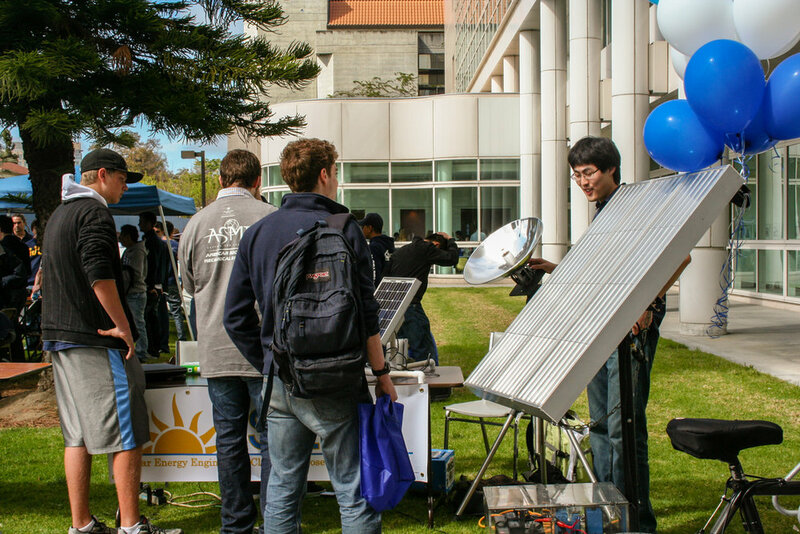 The Solar Energy Engineering Club at San Jose State University was started to give students interested in solar and sustainable energy an opportunity to get hands-on experience working on engineering projects, learn about solar technologies and business trends, as well as get exposure to local industry leaders in solar energy. As the founder and president, I led the initial recruiting efforts and administrative tasks required to get the club off the ground. Once established, the SEEC served as an educational forum for discussion and cooperation between students, faculty, and industry, providing an invaluable networking opportunity. Guest speakers and industry tours were organized periodically to further expand the relationship between academia and industry, including a tour of the local UL facility for testing products from the solar industry. 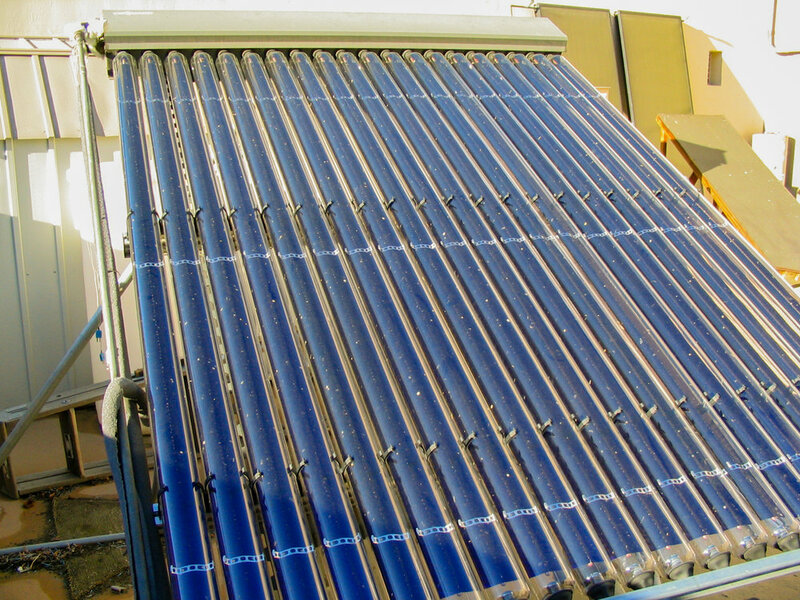 Close up of the indirect circulation solar water heater. These tubes are filled with glycerin, which act as the heat exchanging fluid. 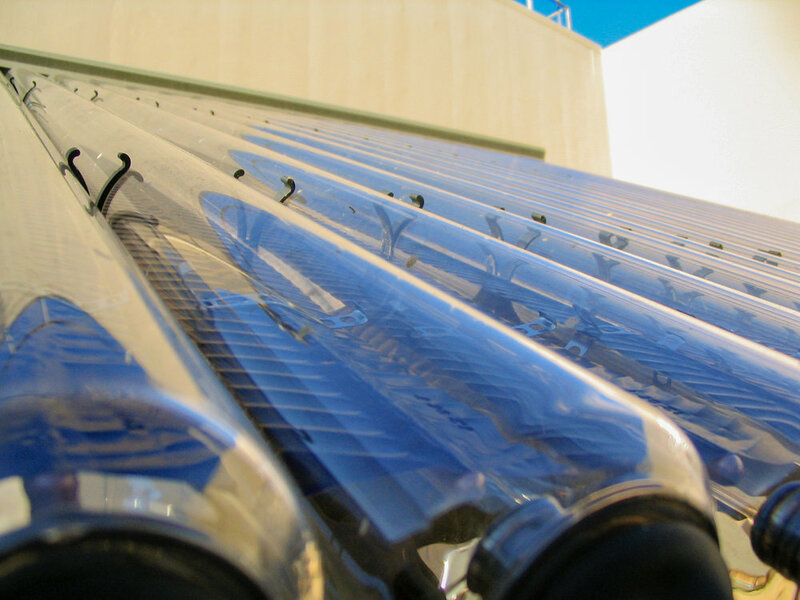 Feasibility analysis of solar water heating systems for the fire stations of the city of San Jose and for the swimming pool of the city of Morgan Hill's aquatic center. Working with the SJSU’s STEM high school outreach organization to develop activities using solar powered toys. Designing a solar charging station to be used during campus events to charge cell phones and serve to advertise and increase visibility for the SEEC and the SJSU College of Engineering. Designing and building a solar water distiller, which I worked on as part of my senior project, capable of generating up to 4 liters of potable water per day. Designing and building an I-V curve tracer, a custom tool used to assess performance of photovoltaic solar panels. The largest project we did was a feasibility study on the installation of solar water heating (SWH) systems on some of San Jose's fire stations. Satellite imagery and onsite visits were conducted to analyze parameters such as shading, mounting locations, and to assess roof conditions, take measurements, and document existing equipment. Through an analysis of past utility bills as well as consultation of official data on different appliances and their respective water requirements resulted in an estimate of the daily water usage and capacity of a potential SWH system. Lastly, SWH panels and system components were specced using a load calculation software programmed to assess and estimate the output of a SWH system. Presenting the complete feasibility analysis of installing solar water heaters on the city of San Jose's fire stations. Special thanks to all the SEEC members and collaborators, and to our adviser, Professor James Mokri.